About 10 days ago or so, we noticed that Paloma had a patch of hair missing from her back…it looked like she had been in a fight or had scraped herself on a fence. We talked to Lopez about it and he thought she had tangled with a wild pig, as that has happened before. He put some medicine on it, but it didn’t help much. It got worse and worse. Patches of hair started turning black and then falling out. We were worried that she had mange (caused by mites). Left untreated mange can be deadly. Since Lopez is away on vacation, we decided it would be best to take Paloma to the local veterinarian now rather than wait for him to return. It seemed like a good idea to take Chiquita to the vet, too. We are guessing that she is between 4 and 5 months old and it might be a good idea to have her spayed. We wanted the vet to give her a general exam to make sure she was old enough and healthy enough for the surgery. Before Lopez left on vacation, we talked to him about having Chiquita fixed and he agreed that it was a good idea. He doesn’t want puppies, either. 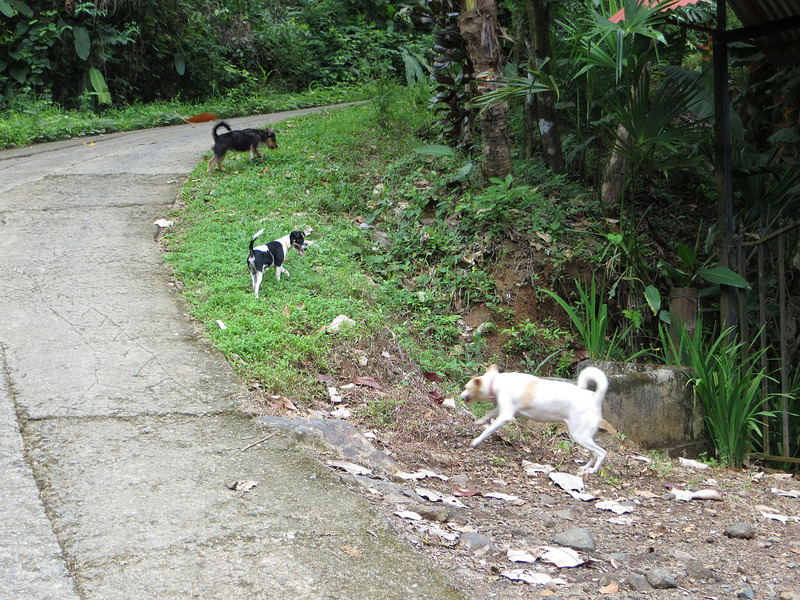 He has told us several times that three dogs is more than enough! On Tuesday, we had an appointment with the veterinarian. 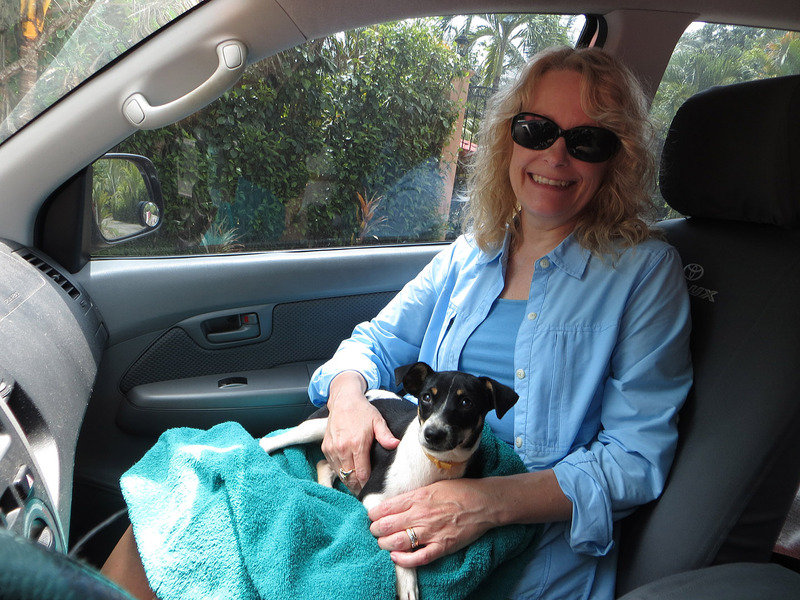 On the drive there, we put Paloma in the back seat and I had Chiquita on a towel in my lap. We weren’t sure how Chiquita would deal with being in the truck. Turns out, she was great and so on the way back we let her sit with Paloma in the back seat. 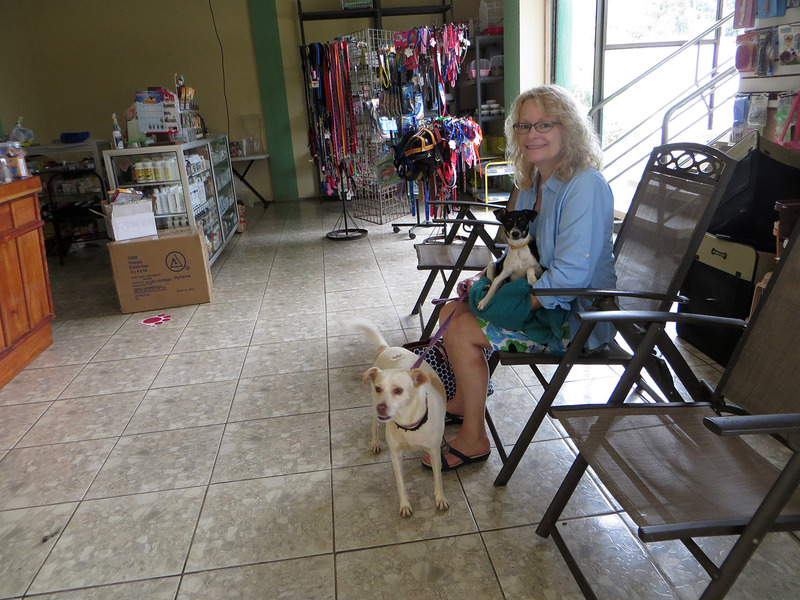 The vet was very nice and he gave both Paloma and Chiquita a thorough exam. Despite flee collars, they both had a lot of flees so the vet put on Frontline. Paloma was diagnosed with a fungus and we were given some anti-fungal cream for her. She received the usual annual vaccinations for an adult dog and a rabies vaccination. (We have no idea whether Paloma had received any vet care during her two year absence.) 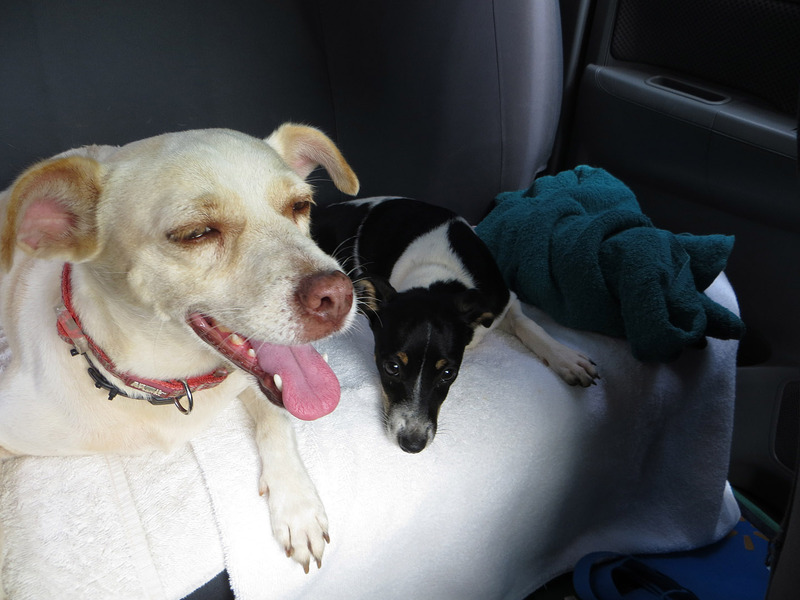 Chiquita was diagnosed with worms and so she (and Paloma) received de-worming medicine. Chiquita received her first round of vaccines and at the beginning of September we will return for the second round. After that, she will be ready to be spayed. Both dogs were very well behaved in the exam room and waiting area. The vet was incredulous when we told him how Paloma had returned to Lopez after a two year absence. Also, he was particularly taken with Chiquita and commented several times that she appeared to be very smart. Both Eddie and I beamed like proud grandparents, go figure! They’re glad to be going back home! Hi Ellen – I’m living in Costa Rica vicariously through you. Still enjoy your blog. Hi Uncle Kal, so glad that you still enjoy our blog! adorable!! You guys are the best!! Thanks so much! The dogs are doing well.